One of the things that I wanted to do on this blog, is that while I expect to focus on gentleman's style is to highlight products other than just clothing. Such as leather goods, Whiskey, accessories and occasionally that will include EDC items such as pocket knives. I've always been a lover of knives of all sorts, but the pock knife is one of the most useful tools a man can carry and can often be made into a thing of beauty by the myriad of craftsmen out there building knives they are useful and luxurious too. My recent particular interest was peak a couple of years ago when I was lucky enough to discover the YouTube channel of Stefan Schmalhaus. 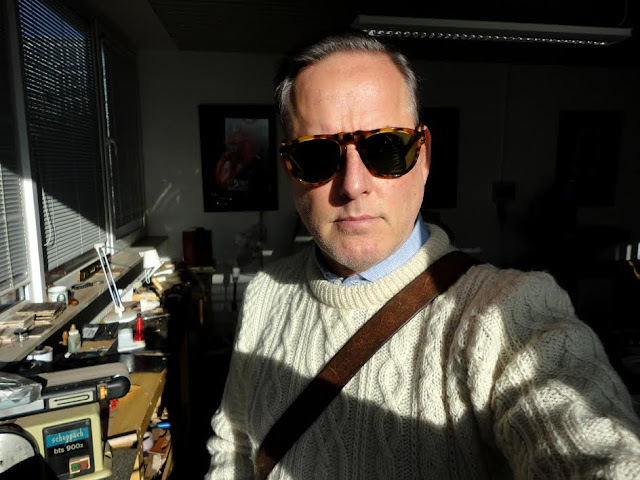 Stefan is a knife collector and knife journalist who is German and writes for German language knife collector magazines. However, for me, the great thing is that his videos are in English and extremely well produced - mostly featuring French, Italian and English knives - a what I would consider 'Gentleman's knives'. Well, I was hooked and as a result of watching these, my interest in knife collecting and especially European 'gentleman's knives' was rekindled. By now I have acquired six or seven of these by now and I rotate them as part of my everyday carry. made by the French knife maker Couteaux-Tisseyre. Founded by Jean-Paul Tisseyre (a recipient of the prestigious award Meilleur Ouvrier de France). The Tisseyre workshops are located in small village of La Bastide-sur-l'Hers, which is in the South of France in the French Pyrenees, about halfway between Toulouse to the North and the Spanish border to the South. Jean-Paul's knives are beautifully made and mine is a fine example of what he builds. Mine is a slip-joint knife with no locking mechanism and with raw buffalo horn crust (a bit raw and unfinished - which adds to it's rustic, old-world appeal) scales. This knife, while nowhere near the most expensive that Jean-Paul makes is extremely well made, with great hand balance and smooth action with a strong spring and a 90 degree stop. It's become one of my favorite knives and probably the one I carry more often the all my other pieces combined. One of the reasons for this is that it's both beautiful to look at and also perfectly proportioned. Measuring it at only 11.7cm long folded and 1.5cm thick including the buffalo scales, it fits easily into my front pock without being too bulky. The blade is slightly less than 9cm and overall the knife comes in at 21cm open. The 'inox 12c27' in the model name refers to the stainless steel used for this knife, which is one of the most widely used in French knife making and holds a good edge. If you are looking for a great quality knife honestly made with the finest materials and craftsmanship, you could do a lot worse than getting a Tisseyre. Jean-Paul is clearly a master of his craft and I'm sure you'll enjoy it for many years to come.